Country clothing is designed with the outdoors in mind, which is why so many of our items are created with specialist technical fabrics. When an item made for country use says its waterproof, it better be waterproof. It’s the same with an item that claims to be durable or have superior warmth, you haven’t got the tolerance for exaggerated claims when you’re out in torrential rain, pushing through brambles or vulnerable to the blistering whipping wind. You want the best clobber for your money, which means clothing that uses the latest in technology to ensure you’re purchase does everything it’s supposed to, and does it well. It’s important that your clothing lives up to expectations and most high specification fabrics are so well known, you can trust that you’re not going to be let down in your time of need. A lot of Technical fabrics cross over many different brands that we stock, which shows that they are the best on the market. Sometimes it can be a little daunting and difficult to understand what all of these different fabrics do and you can be left wondering whether they are worth the money or whether you are paying for the name. We will go through the technical fabrics, what they do and some examples of which clothing you can find them on. Hopefully this will then work as your guide, so you know which fabrics are going to best work for you. Let’s start with GORE-TEX®, widely regarded as the ultimate outer-fabric, their tag line is ‘guaranteed to keep you dry’. It is a fabric renowned for its waterproof breathability and when your item is made from it, you know you will stay dry. Waterproof: Wet fabric conducts heat three times faster than dry clothes, robbing your body of heat. Some fabrics that claim to be waterproof can’t often stand up to real-life conditions, leaving you cold and wet, upsetting whatever you are doing, whether it enjoying an outdoor activity or work. GORE-TEX® promises truly durable waterproofness, keeping water out even through prolonged use or harsh applications in demanding conditions. Each microscopic pore is 20,000 times smaller than a droplet of water, so that (what felt like a) monsoon you were caught in or that puddle you stepped in, is not going to penetrate the membrane. Windproof: Textiles such as microfibers, closely woven fabrics, and many fleece materials are considered windproof but sometimes wind can still penetrate the fabric leaving you feeling chilled. In technical terms, a fabric can only be considered truly windproof if its air permeability is 5 l/m2sec (the volume of air that travels through one square metre of fabric per second) or less. All GORE-TEX® products meet or exceed that standard. Breathable: At first thought you’d think breathable meant the ability to let air through, but that is misunderstood, if a fabric is windproof it certainly doesn’t want air to move through it. In fact, breathability refers to how well sweat can escape as moisture vapour. Remember that tiny pore size? Well it’s still 700 times larger than a moisture vapour molecule, so heat and gas can be released pretty easily. 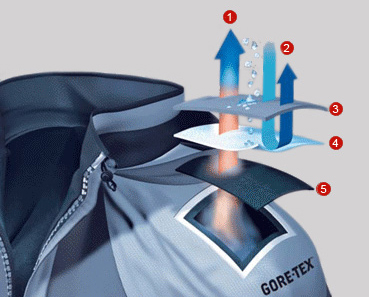 With GORE-TEX® you know you can trust it will work for you, the innovative fabric is used by specialists in many fields and the fabric is put through extensive tests, some of which you can watch on the GORE-TEX website, unfortunate testers getting blown by 32mph wind or blasted with water! Seen as though the majority of country clothing requires waterproof advantages, a huge selection of our products incorporates GORE-TEX® in some way. Many fabrics are waterproof, a bin liner would slide water straight off you, but when you are outdoors shooting or working (or any form of exertion), being waterproof often isn’t enough, if you wore that not breathable bin liner you would probably lose a stone in sweat, as well as your sense of humour. You will find GORE-TEX® as the liner in many shooting jackets, trousers and boots to keep you lovely and dry when you’re outdoors all day exposed to the typical English weather. Neoprene is a widely used material and is one of the few that isn’t branded, it belongs to the synthetic rubber family and was initially used by fishermen when wading in rivers and lakes; it then went on to be the material traditionally used in wetsuits. It soon made an appearance on dry land as its properties were utilised for other uses. Neoprene’s resistant and thermal properties make it a perfect outdoor companion. Offering superior warmth and comfort it is often used in wellington boots; the lining can range from 2mm-5mm thick neoprene and the closed cell construction retains heat and creates a snug fit. Hunter, Le Chameau, Harkila and Seeland all have wellies boasting a neoprene lining. Neoprene can withstand temperatures from -50°C to 120°C. It’s also inherently resistant to ozone, weathering, and water or soil immersion, which means it’s long lasting and durable. You can also find neoprene gloves, especially shooting gloves, as it gives a close, snug fit and offers optimum warmth and durability. OutDry® is a patented technology which sets to revolutionise the performance and comfort of waterproof boots, shoes and gloves. It works by laminating the waterproof, breathable membrane directly to the external layer of the boot. This is remarkably different from other waterproofing processes because it means that there is no air gap left between the outer of the boot and the waterproof membrane, which occurs when using other waterproof liners. This means that the shoe lasts longer, as no water gets in, and moisture is able to escape. Polartec® is a family of soft, easy care and pill resistant, breathable fabrics that provide excellent warmth to weight ratios through the use of low absorbency high loft polyester fibres. Schoffel have embraced Polartec® Thermal Pro®, which provides the highest warmth to weight ratio that any polartec fabric has offered. 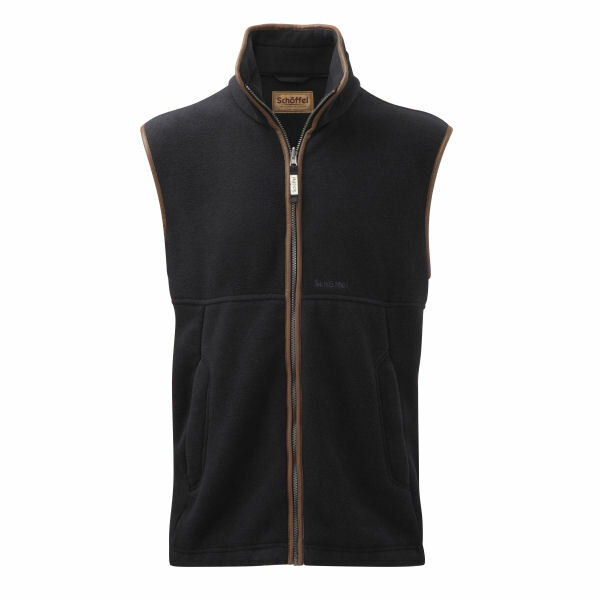 Thermal Pro is 100% polyester and the surface creates pockets that trap air and retain body heat, providing outstanding warmth without weight. 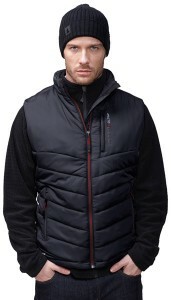 It offers excellent breathability and dries extremely fast. 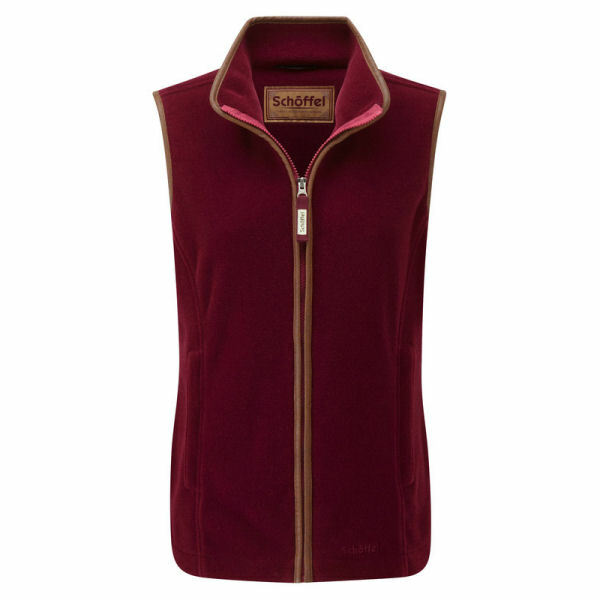 It is used in many Schoffel fleeces, most notably in the best-selling Oakham and Lyndon Fleece Gilets… cosy! PrimaLoft®, also referred to as Synthetic Down, is a particular mix of synthetic microfibers that compare favourably to down. It is proven to provide an equally efficient thermal barrier, be of equivalent density, possess similar soft and supple compressional properties and has superior loft retention when wet. 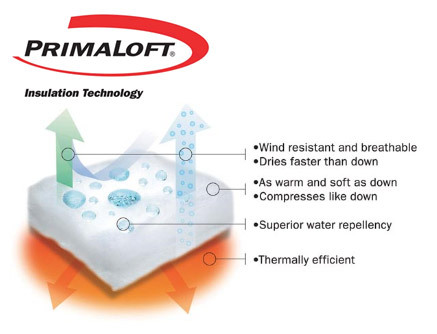 Unlike down, PrimaLoft®’s individual fibres are water repellent, which means it is able to retain 96% of its insulating capability when wet by maintaining its loft, and therefore is used in clothing intended to be used in cold, wet conditions. The Dubarry Carra Quilt (left) is light weight, super warm PrimaLoft® insulated jacket, with a sleek, slim and stylish sillhouette. The Musto Evolution Primaloft Gilet (right) offers excellent warmth to weight ratio and has a durable water repellent finish to double the waterproof effectiveness. WINDSTOPPER® is an extension of the Gore enterprise, by adding it as a membrane between layers of the outer and inner fabric, the item becomes completely windproof. 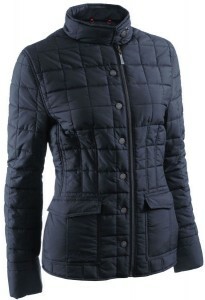 Gone are the days where the chilling wind penetrates every layer of clothing! The revolutionary WINDSTOPPER® structure is ultra-light, ultra-thin, and highly resistant to extreme temperatures. The microporous structure of the membrane ensures maximum breathability; cold wind is kept out, but moisture vapour can easily escape. The WINDSTOPPER® membrane is used as a laminate to form a very breathable & durably windproof barrier, garments containing it provide up to 2 and a half times more thermal insulation than conventional non-laminated garments. 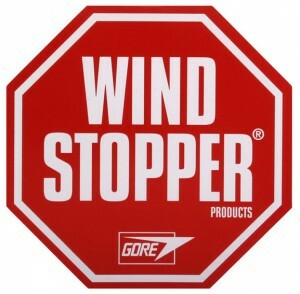 Items that incorporate WINDSTOPPER are ideal if you live in blustery climates, sometimes it’s used together with other technology, such as GORE-TEX®, to give optimum protection from the elements. The Musto WINDSTOPPER® Gloves are a must-have item if you spend a lot of time outdoors, the 100% wool knitted Harkila Annaboda Shooting Jersey boasts the windproof lining and comes in a variety of colours and the Schoffel Rutland WINDSTOPPER® fleece proves extremely popular, combined with Polartec® Thermal Pro® it’s one of the warmest fleece jackets available at Philip Morris and Son. 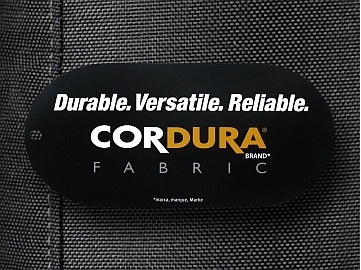 CORDURA® is a fabric which provides rugged durable performance. Products made with CORDURA® fabrics feature enhanced tear and abrasion resistance, and long-lasting durability. When you’re out shooting, you often have to battle against the elements – harsh weather, rugged terrain, thorn bushes, you name it. Items made with CORDURA® are designed to be your comrade in that battle, tough enough for the field you will find it complements an entire arsenal of shooting gear such as jackets, vests, trousers and gaiters, so you can stay focused on enjoying your day, not hindered by your clothing. CORDURA® Classic fabric is constructed with qualifying yarns which are woven in accordance with INVISTA’s approved fabric standards. There we have it; technical fabrics are what make up the majority of our Brand’s specialist country clothing, to bring you the best of what’s on the market and to tailor to your needs. All of these fabrics are widely recommended, tested and trusted, that is why our brands put their trust in them so that you reap the benefits. CORDURA, Country Clothing, Dubarry Carra Quilt, GORE-TEX, GORE-TEX Boots, Gore-Tex Jacket, Gore-Tex Shooting Jacket, Musto Arncliffe Country Ankle Boot, Musto Country Gloves, Musto Evolution PrimaLoft Gilet, Musto Windstopper Gloves, Neoprene, Neoprene Boots, Neoprene Wellington Boots, OutDry, Polartec, PrimaLoft, Schoffel Lyndon Gilet, Schoffel Oakham Gilet, Shooting Gloves, Specialist Fabrics, Technical Fabrics, WINDSTOPPER. Bookmark.